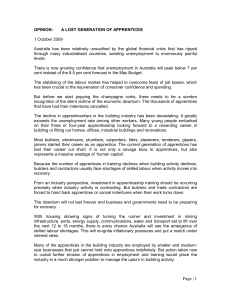 Apprenticeship is a system of training a new generation of practitioners of a trade or profession with on-the-job training and often some accompanying study (classroom work and reading). Apprenticeship also enable practitioners to gain a license to practice in a regulated profession. Apprentices or protégés build their careers from apprenticeships. Most of their training is done while working for an employer who helps the apprentices learn their trade or profession, in exchange for their continued labor for an agreed period after they have achieved measurable competencies. Apprenticeships typically last 3 to 6 years. People who successfully complete an apprenticeship reach the journeyman level of competence.Although the formal boundaries and terminology of the apprentice/journeyman/master system often do not extend outside of guilds and trade unions, the concept of on-the-job training leading to competence over a period of years is found in any field of skilled labor.In early modern usage, the clipped form prentice was common.